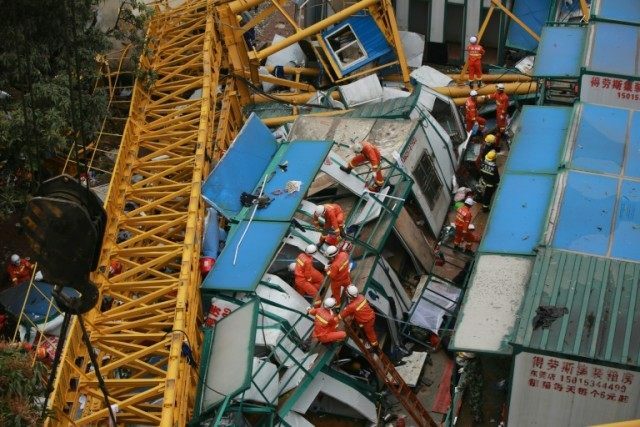 Beijing (AFP) – A huge crane which collapsed in high winds killed 18 people at a construction site in southern China early Wednesday, state media said. Another 18 are in hospital after the accident in Mayong township, part of the city of Dongguan in Guangdong province. The crane’s gantry plunged onto a two-storey temporary building made of shipping containers during a thunderstorm which brought winds of up to 100 km/hour, said Luo Bin, deputy secretary-general of the Dongguan city government. Luo, quoted by Xinhua news agency, said a total of 139 workers were in the building when the accident occurred. Four of the injured were described as in serious but stable condition. The fallen gantry is estimated to weigh 80 tonnes, according to a firefighter quoted by Xinhua. The city government has set up a team to investigate the accident.